There was a time when the struggle for social justice in America was inseparable from the fight against poverty. Is that still the case today? The chart below was compiled by entering terms into the search engines of various media and then recording how many “hits” they generated. This provides an imprecise but nonetheless helpful measure of how much attention these media paid to various issues. The figures are all from searches performed on 1/9/07. As anyone can see, there isn’t much difference between the left media and the mainstream media in terms of priorities. At The Nation, there were 13.5 hits on “AIDS” for every one on “Homelessness,” at Democracy Now there were 12.3, and at the New York Times, there were 9.4. At Commondreams.org there were 4.1 hits on “Hamas” for every one on “Homelessness,” while at Truthout.org there were 6.7 and at Time there were 5.2 (only Mother Jones had more hits for “Homelessness” than for “Hamas.”). On the surface, at least, the millions of Americans who become homeless every year would seem to be just as unimportant to the left as they are to the powerful corporate oligarchs who control most of our nation’s media. But what kind of social justice movement doesn’t care about the poorest of the poor? 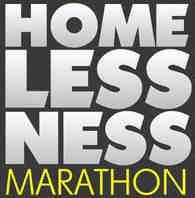 At the Homelessness Marathon, we think that’s a question worth asking.